Photo of: West of Ireland: Limerick: King John's Castle. 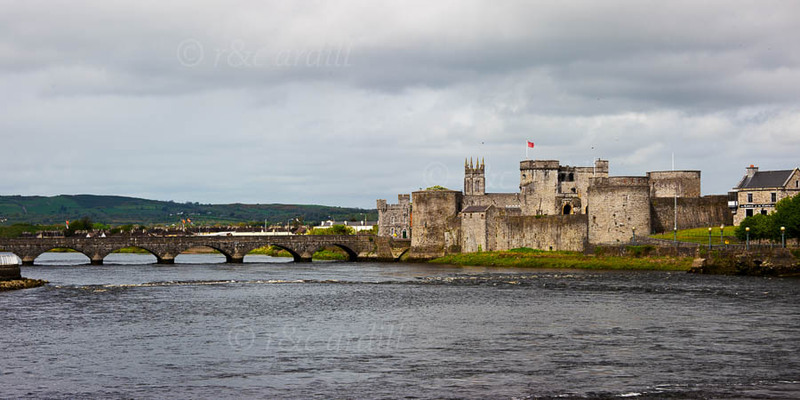 This is an image of King John's Castle and the fine stone bridge that spans the Shannon. The cloudy day gives a fittingly ominous feel to the great Anglo-Norman castle. King John's Castle is a 13th century Castle on King's Island on the Shannon, in the heart of medieval Limerick City. The Vikings built the first permanent Viking stronghold on Inis Sibhtonn (King's Island) in 922. From here they raided the length of the River Shannon from Lough Derg to Lough Ree, pillaging ecclesiastical settlements. In 937 they were defeated by the king of Munster and they were forced to pay tribute to the clans. In 1174 Domhnall Mor O Briain burned the city to the ground in a bid to keep it from the hands of Anglo-Norman invaders. After he died in 1194, the Anglo-Normans captured the city, under John, Lord of Ireland. A castle, built on the orders of King John and bearing his name, was completed around 1200.